people to grow and develop. Neuroscience may say the leader, in their Coaching role, helps facilitate self-directed neuroplasticity. We’ll explore what this means shortly. There are some similarities between a leader’s overall role and a leader in a Coaching role. There is strength in a leader being able to step into many roles while retaining their overall title of a leader. What does neuroscience add to leaders and Coaches? Neuroscience offers us another lens through which to view things. Most of the time it doesn’t replace psychological insights or observations of people’s behaviour. It adds another perspective. With this addition we can gain further clarity. I believe, and suggest that neuroscience research supports this proposition, that the nature of a great leader is that it inspires following. It doesn’t grab a person by the scruff of the neck and drag them along. It is inviting, enticing, even alluring. Coaches don’t direct people. They facilitate self-direction. The coachee or the follower chooses what they want and where they want to go. People need connection. Social isolation is painful and bad for our physical and mental health. One of the roles of the leader and the Coach is to be aware of this and make it easier for people to connect to others. Different people obviously need different styles and amounts of ‘people time’ but what we’re talking about here is making it easy for people to feel included and connected. Most people when asked would agree that fairness is a desirable trait for a leader. Most people wouldn’t know that the anterior cingulate cortex, the ACC is involved when we feel we are being treated unfairly. In a lab people have responded powerfully when they think something is unfair, even rejecting money – which in the workplace could speak volumes. People are likely to be less productive if they think unfairness is present. Creating opportunities for people to release oxytocin by trusting and being trustworthy could strengthen the bonds within your organization. Lots of leaders say trust and honesty are important but there are often gaps or subtle signals that raise alarm bells for individuals. Congruency is important. It is possible for people to change we see it frequently. People learn new things, this involves at some level, changes in the brain. A range of experiments shows structural changes occurring in the brain – a process we call neuroplasticity – the plastic nature of the brain. We started by suggesting that there are similarities between a Coach facilitating self-directed neuroplasticity and the work of a leader. What do you think? Is part of a leader’s role to make growth and development as easy as possible? If so then understanding how the brain, which drives everything, really works can be very useful indeed. Amy Brann studied medicine at University College London. Through her business, Synaptic Potential, she works with many companies to help them better understand their teams, clients and organizations as a whole. 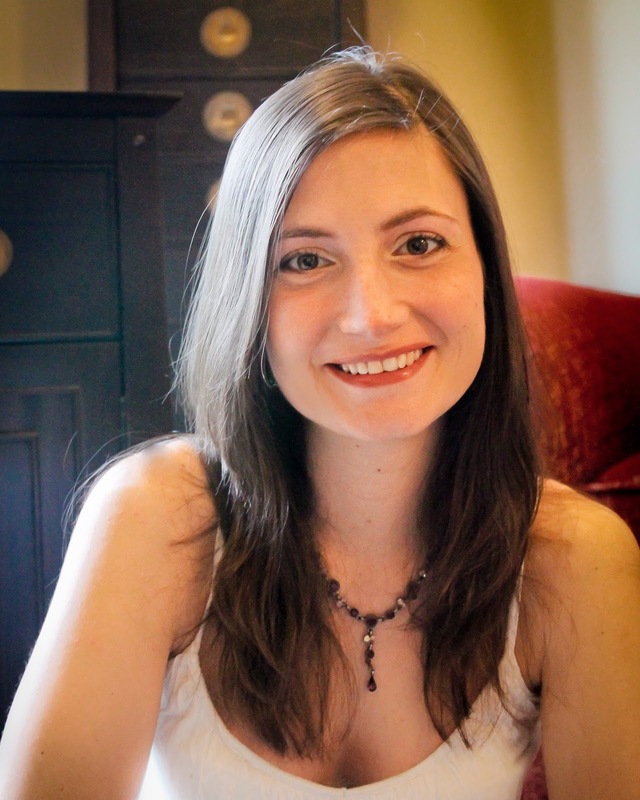 Brann is the author of Neuroscience for Coaches: How to Use the Latest Insights for the Benefit of Your Clients (2014, Kogan Page), and she is the creator of the online community, "Neuroscience in Business" and has been the Lead Coach for Europe for one of the largest NLP Training Companies in the world." Onboarding today looks nothing like onboarding of ten or twenty years ago. Acclimating new millennial employees to company culture requires creative thinking and modern tactics. Read Beth Miller’s new guest post over at About.com Management and Leadership to find out how. Whether we like it or not, there is always a regular infusion of youth into the workforce. It is essential to understand the psyche of youngsters before making heroes out of them or, at the other extreme, deriding them as being immature. 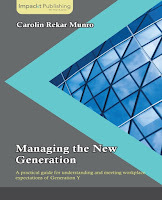 Read Carolin Rekar Munro’s guest post over at About.com Management and Leadership for practical insights into the millennial workforce called generation Y. Teams at work are like portfolios of people with different skills and performance patterns. Like smart investment managers, smart people managers figure out how to shift their investment of time and energy from some parts of their portfolio so they can invest more in other parts where there is more potential for improvement. Here are four moves that smart leaders do to get the highest overall return from their team. 1. Stop Micromanaging your Exemplars – You know who the Exemplars on your team are. They are the star performers who produce great results without needing much help from you. Many leaders, however, spend more time than they need to direct or check the work of their Exemplars. Not only is that a waste of the leader’s time, but it can be frustrating to the Exemplars. Leaders often over-manage Exemplars because it is easier than managing other people on their team who need more supervision but are harder to work with. Some leaders may also spend too much time with their Exemplars because they think that by doing so, they might get more credit for the great results the Exemplars generate. Weak leaders may even worry that their Exemplars are more respected than they are, making them want to exert their formal authority more. Whatever the case, smart leaders will dial back their micromanagement of their Exemplars to free up some of their own time to invest elsewhere. 2. Start Managing your Passengers – Passengers are the folks on your team who show up to work but you have a hard time finding any results other than paystubs from them. They don’t annoy you or get in the way of other people on the team, but they are dragging your team down. Your team morale suffers because, even if you don’t notice Passengers’ lack of real results, their colleagues do and resent you for letting them get away with not pulling their weight. Some leaders shy away from managing their Passengers because it is uncomfortable. The “you need to start pulling your weight” is a difficult conversation that weak leaders avoid. The thing Passengers are best at is not causing trouble, so a weak leader finds it easy to just ignore the problems. But if a leader does start holding a Passenger accountable for the same results as their peers, good things will happen. The Passenger will start producing or make it easier for the leader to make way for someone who will. And their peers may step up their results as well as the team morale improves when they see their leader making much needed, albeit uncomfortable, moves for the overall good of the team. 3. 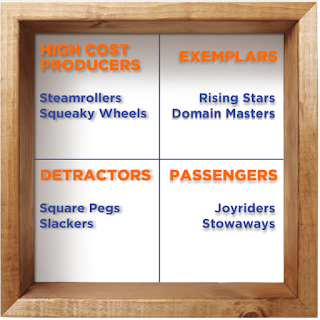 Stop Enabling your High Cost Producers – Like your Exemplars, the High Cost Producers on your team produce good results, but they incur high costs along the way. They may cause a lot of problems and ill will with others as they steamroll their way to results. Or they may need a lot of hand-holding from you to get their job done. Either way, you are enabling them by fixing their problems and doing their thinking for them. If a steamroller hurts a relationship, you are probably using your own political capital to sooth unnecessarily hurt feelings. If you are helping make decisions that one of your team members should be making, you are now taking accountability for the results of those decisions. Making your High Cost Producers accountable for cleaning up their own messes and making their own decisions is the best way you can force them to develop the skills they need to be independent. It also frees up time for you to help others on your team who need the help more. 4. Start Addressing your Detractors – You know who the Detractors are on your team, and everyone else does too. They are the people who are not pulling their own weight and are also pulling everyone else down because of the problems they cause. You end up spending a lot of your time cleaning up their messes or doing their jobs. They may just lack the skills they need to get their job done but are not willing to ask for help for fear of showing weakness. Maybe their job changed but they didn’t get the additional training they needed. Or they maybe they just lack the motivation to do their job. Whatever it is, you owe it to them, and to the rest of your team, to quit just throwing band aids on their problems and address them directly. The Detractors need to know the status quo is not sustainable, they need to get out of the rut they are in, and that you will do all you can to help them. You will stop spending your time covering up their problems and spend the time it takes to help them build the skills they need to keep their job. 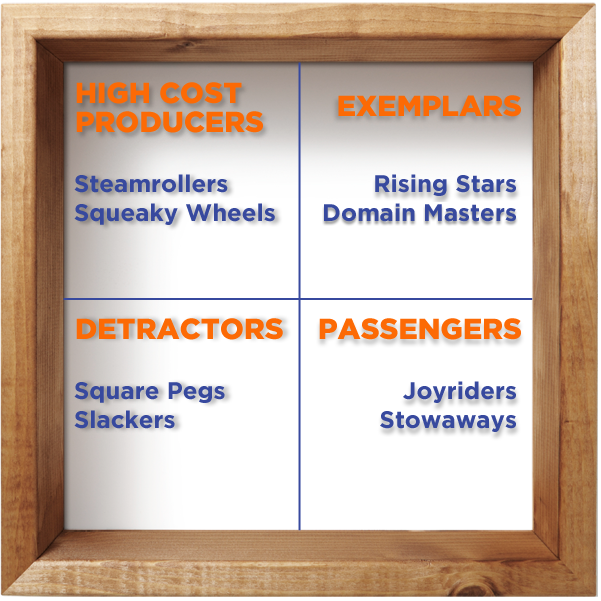 To help you figure out where these opportunities are on your team, you can take this online assessment to diagnose your own team situation. To learn more about the framework behind this methodology, you can read Lead Inside the Box: How Smart Leaders Guide their Teams to Exceptional Results by Victor Prince and Mike Figliuolo. Victor Prince: As the Chief Operating Officer (COO) of the U.S. Consumer Financial Protection Bureau (CFPB), Victor Prince helped build a new federal agency and led a division of hundreds of people. As a consultant with Bain & Company, he helped clients across the United States and Europe develop successful business strategies. Today, Victor is a consultant and speaker who teaches strategy and leadership skills to clients around the world. Victor is co-author of Lead Inside the Box: How Smart Leaders Guide their Teams to Exceptional Results, (Career Press, July 2015) which is now available at Amazon.com, Barnes & Noble and other retailers. One of the best ways to develop a broad and deep set of leadership competencies is to move around in a variety of challenging and diverse jobs. The most successful leaders, especially general managers, tend to hone their skills by working in different functions, geographies, and product lines. Read my latest post over at About.com to learn how to set up a “Manager Exchange Program” in your organization as a way to facilitate management development moves. When your boss leaves, it’s important to get off to a good start with your new boss. Read my latest post over at About.com for 10 ways to make sure you and your boss start off on the right foot, and 5 ways to ensure you’ll be looking for a new job soon. When I consult with executives on crafting a high performance, values-aligned culture, one of the first things I do is to examine the effectiveness of their leadership team. Whatever that team is called - an executive team, a leadership team, a management team, etc. - that core team must model, reinforce, coach, and drive their desired culture. They must act with one mind, one heart, and one voice to create an engaging, productive work environment. Most leadership teams I observe are not teams at all. Most are groups whose members focus on their functional team’s needs, not the organization’s needs! Members of the leadership group battle their peers daily for limited funds, resources, and people, day in and day out. That’s no way to create a high performing, values-aligned organization. Do leadership team members move beyond their functional duties and embrace leadership team membership as a separate and equally important role? Do they act as committed, responsive members of the executive team to present a united voice on how the organization operates, not just how it performs? Do they willingly engage with their team peers in strategic discussions and plan how to inspire aligned behavior across the company’s leaders and associates? Do they set aside their functional activities so they are fully present for their leadership team conversations? Do they inform their staff that they are not to be interrupted during the team meetings with functional activities and issues? Do they set aside their smartphones, tablets, laptops, and spreadsheets and focus fully on the discussion “in the moment”? Do they validate peers’ ideas, efforts, and accomplishments frequently? Do they pay attention to the nuances of the discussions - and dig deeper when a potential issue is raised? Do they ask everyone to participate so quieter members are given the floor to provide their comments, insights, or questions? Who facilitates the team's discussions? Who drives for decisions to be made? If all members are comfortable doing that, it’s a clear indication of trust, respect, and validation. Do discussions end with members proactively summarizing options, making recommendations, and end with a clear, mutual, firm decision or action being made? If consensus is not being reached, do all members engage in the discussion to reach consensus quickly? Is there clear agreement by everyone on what the decision is and what that decision will require of team members? Do members volunteer to take responsibility? Do members challenge each other to greater targets and challenge each other when a member doesn’t do what they said they would do? When leadership teams demonstrate these approaches consistently, the team is able to gather relevant data, decide confidently, communicate effectively, and hold each other accountable for team responsibilities. Only when a leadership team acts with one mind, one heart, and one voice will they effectively inspire their organization to top performance, cooperative interaction, and inspired service. How well does your leadership team model these factors? Add your thoughts in the comments section below. 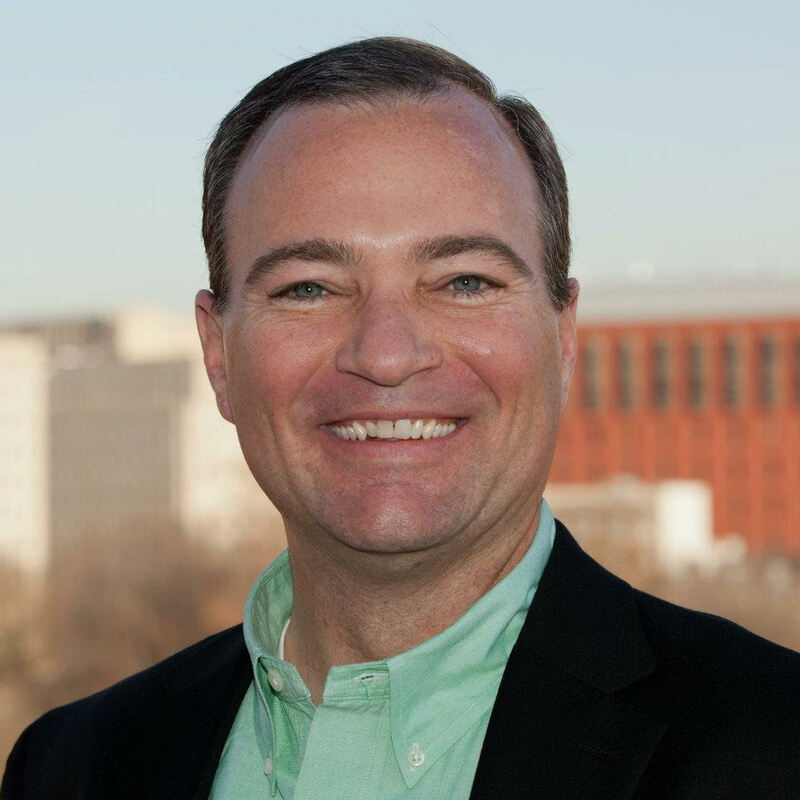 S. Chris Edmonds is a sought-after speaker, author, and executive consultant. He’s the CEO of The Purposeful Culture Group. After a 15-year career leading and managing teams, Chris began his consulting company in 1990. 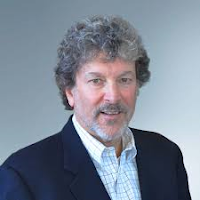 Since 1995, Chris has also served as a senior consultant with The Ken Blanchard Companies. He is the author or co-author of seven books, including Amazon best sellers The Culture Engine and Leading At A Higher Level with Ken Blanchard. His blog posts, podcasts, assessments, research, and videos can be found at http://drivingresultsthroughculture.com. Warren Bennis, acclaimed scholar, author and advisor to corporation presidents said "Leadership is the capacity to translate vision into reality." Well expressed, but it's easier said than done. What's needed are practical steps to develop a communicable vision coupled with practical steps to achieve employee buy in. 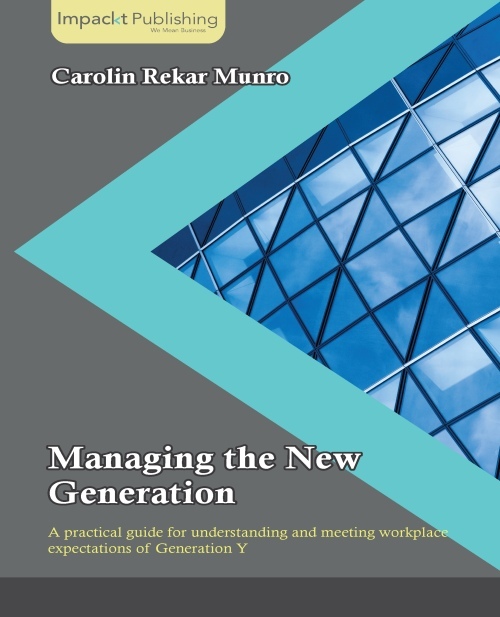 Notice that I emphasized the word practical, because unless the leader's vision is easy to understand, believable and clearly stated, even the most imaginative vision will become just another page in the employee manual gathering dust. Let's first define "billboard effect" and how it translates into developing a workable vision that achieves employee buy-in. A billboard is the visual image of the leader's vision. In few but meaningful words it paints a picture of what the company and its people stand for and what it wants to achieve. It is future oriented and describes where the company expects to be tomorrow and from there onward. Next, let's examine steps in developing the vision, then steps in getting the organization's people to buy into that vision. § Highly effective leaders have big ideas. Small ideas are okay, but they're not transformative. Big ideas help companies and employees face the challenges of tomorrow. This is no better expressed than Robert Kennedy quoting George Bernard Shaw: "Some men see things as they are and say, 'Why?' I dream of things that never were, and say, 'Why not?' " Companies with leaders who have the imagination and drive to adopt big ideas are the Apples, Googles and Ubers of tomorrow. Those big ideas are nurtured by leaders who make astute observations of their companies and their industries, and then reflect and decide what visions need to be in place to handle tomorrow's problems and opportunities. § Reflection is the stimulus that leads to big ideas, but leaders know that clear and careful expression of their visions must be committed to writing. The process of writing clarifies visions such that they can be robustly expressed in words that command the organization's attention. § With the visions now distinctly articulated, leaders can construct and post billboards throughout the organization and express their visions during talks with members of the organization. These billboards, reduced to clear maxims, concisely reflect those visions. For example, "Our company will take whatever measures needed to assure that product quality satisfies our customers, or we will return their money without question." That is both clear and unambiguous. And it sets the stage for transformation of the organization to achieve that vision. § Leaders should be prepared to tweak, modify, and even change vision statements when those visions aren't producing expected results. When it comes to vision nothing is set in stone. The mark of a highly effective leader is the willingness to forgo ego and do what is right for the organization. The best of leaders prepare alternate plans. § I would argue that the very first prerequisite for employee buy in is to simply listen to what employees think and say about their jobs and the company's direction. Keeping an open ear is crucial. And don't get distracted by their complaints. Remember that engaged employees, those who really care about the company, expose many of the organization's problems and lost opportunities through complaints. This is a great chance for leaders to make positive changes based on worthwhile employee suggestions. § I would become suspicious if employees don't gripe. That means their voices are being throttled, and that is the absolute worst situation of all. § Employees need positive reinforcement. They won't buy into a faulty vision, one that is not productive. That implies going beyond the stage of encouraging them to speak freely. It means measuring how successful the company's vision is working. Take the quality example mentioned before. How are employees (or managers for that matter) going to know how successful their efforts are without measureable feedback? That means providing them with yardsticks of performance. It entails, in this example, weekly or monthly reports on rejects, scrap, customer complaints and customer returns, with as much data as possible reflecting individual employee performance. § Additionally, to combat what I call "vision tedium," employees need to know how effective the company has been pursuing its vision long-term. Quarterly and annual postings will tell the tale along with periodic meetings with employee groups. § Leaders should put in place a follow-up procedure (possibly an annual review) because employee buy in of vision is not a one-time event. Constant follow-up is required to assure that employees remain engaged, informed and responsive to emerging problems. One of the difficulties of either a mature or growing organization is that leaders stop emphasizing company priorities and changes in priorities. They may delegate vision just as they delegate tasks, but the two are not equal. Vision remains both the prerogative and responsibility of organization leaders. 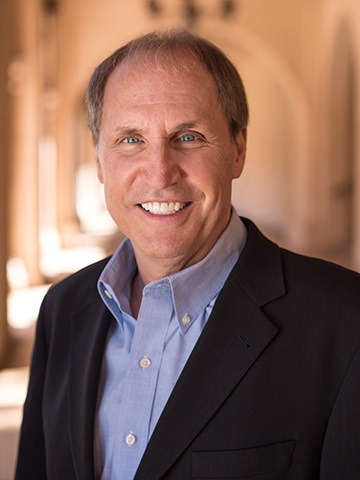 Jeff Wolf is the author of Seven Disciplines of a Leader and founder and president of Wolf Management Consultants, LLC, a premier global consulting firm that specializes in helping people, teams and organizations achieve maximum effectiveness. Wolf also blogs at Jeff Wolf on Leadership. I’ve been sharing this information with my network and it’s generating a lot of interest. While we’ve all know that awareness of strengths and weaknesses and how we are perceived by others is essential to being an effective leader, it’s interesting to see a connection made to a firm’s financial results. An analysis by Korn Ferry (NYSE:KFY), the preeminent authority on leadership and talent, shows that public companies with a higher rate of return (ROR) also employ professionals who exhibit higher levels of self-awareness. The Korn Ferry Institute analyzed a total of 6,977 self-assessments from professionals at 486 publicly traded companies to identify the “blind spots” in individuals’ leadership characteristics. A blind spot is defined as a skill that the professional counted among his or her strengths, when coworkers cited that same skill as one of the professional’s weaknesses. • Poorly performing companies’ professionals had 20 percent more blind spots than those working at financially strong companies. • Poor-performing companies’ professionals were 79 percent more likely to have low overall self-awareness than those at firms with robust ROR. Hazucha says a person’s level of self-awareness can be increased through 360-degree performance appraisals paired with effective coaching. This in turn drives improved performance and greater work satisfaction. While being aware of your limitations sounds like a no-brainer, it’s not. First of all, it’s hard to get honest, accurate, behavior feedback. People are uncomfortable telling the emperor he/she has no clothes, and leaders often shoot the messenger or ignore the feedback. 360 degree assessments are one way to get feedback and build self-awareness, but not everybody has access to these tools. I’ve written about other ways to get feedback – where there’s a will there’s a way, if a leader is willing to ask and listen. It’s called the “knowing-doing gap”. We may know we are supposed to eat healthy foods and exercise, but at the end of the day, we make a zillion excuses not to, put off going to the gym and give in to the temptation of those chocolate chip cookies. So how does a leader move from knowing to doing? Working with an executive coach can help a leader overcome their limiting beliefs and barriers, generate options and action plans, and help keep the leader focused and motivated. But again, not everyone can afford to hire an executive coach. A newly self-aware leader either have to be motivated enough to do it on their own (the “just do it approach”), or they could work with a supportive manager, mentor or peer coach (a learning partner). That’s assuming the leader wants to change. Take it from executive coach Marshall Goldsmith: When People Don't Want to Change -- Don't Waste Your Time! So the next time someone approaches your tentatively and asks “can I give you some feedback?” – drop everything, pay attention, and thank the person for the feedback. Then, don’t just stand there, do something about it! You’ll be a better leader, a better person, and you will be making a positive contribution to your organizations financial. In order to lead effectively in an increasingly VUCA (volatility, uncertainty, complexity and ambiguity) business environment, today’s leaders need to develop the ability to build collaborative relationships. The ability to build coalitions and work collaboratively becomes even more important as a leader takes on more and more responsibility and the organization grows. Collaboration is no longer a “nice to do” – it’s a leadership requirement needed to get results and advance in any organization. Read my latest post over at About.com Management and Leadership for 10 ways for a leader to build more collaborative work relationships. Everyone hates performance reviews for three reasons that we just need to accept. However, there are three relatively simple fixes that can make the process a lot less painful. Why We Hate Performance Reviews and How to Improve Them. More than ever, customer experience is a priority for CEOs in nearly every industry. With the ability to spur customer-driven growth and business transformation, Chief Customer Officers (CCOs) have become embraced as the go-to role for customer experience. However, senior executives should know before they decide on a CCO, that this position requires a personal commitment from them. There are eight major actions the CEO should do to ensure CCO success. The CEO should position the work of the CCO as a priority of their agenda. People must understand that they will be delivering directly to the CEO by working with the CCO. Does your CEO clearly articulate what he/she wants the company to become for customers and constantly reinforce and drive the company in that direction? Is there a commitment for organizational transformation, not some one-off tactics and silver bullets? Ensure that the CCO is at a peer level of the leaders of the organization. This role will be involved in facilitating change to how the business operates and requires the ability to function, ability to establish and build relationships and ability to enable others to be successful equal to an executive level position. Has the CEO ensured that the role is positioned as an officer of the company with the full support and engagement of the CEO, leaders and the organization? 3. Establish Acceptance/Role Clarity/Suspend Cynicism. After initiating the CCO role, it’s important to establish the working relationship between the company leadership and the CCO. Agree with the other leaders how they will personally engage with the CCO and how their organizations will participate with you. Is the leadership team in alignment about the role and how they interact as a team? Is there clarity across the organization that this role is to enable and establish a one-company approach and discipline to customer experience, not to take over their work? Put the CCO in the position of doing specific and tangible work within the first month of the job. Engage the leadership team to be personally involved in guiding version 1 of the five competencies. Make it the first order of business to drive the metrics of customer loyalty and customer profitability. This type of tactical kick-start will help you gain the momentum you need for the long-term success of the CCO. Are tactical projects put in motion so that people understand the role and its value? Are early-adapters and enthusiast leaders identified to work with first to prove role value? Don’t make your CCO expend energy and cycles lobbying to get a place on the corporate agenda. Instead, establish a set of meetings with the specific agenda of discussing and advancing the customer experience work, such as a customer room. Create continued clarity by having the CCO drive these meetings and steer the process. Will your CEO unite the leadership team to establish one-company accountability to priority customer experiences? Are forums for accountability regularly scheduled and enforced as a key strategic meeting for the success of the company? A CCO who is forced to navigate this work alone will wear out over time as the isolation of the job mounts. An absent executive team who commits to the work but does not actively engage, turns the CCO into a beggar, constantly asking for people to give the work the time required to embed it into the organization. Does your CEO commit time and resources to ensure that the C-Suite will unite in customer experience improvement and culture? Does your CEO play an active role in understanding and participating in the rigor of aligning the company when necessary? The CEO must set realistic expectations that this is at minimum a three- to five-year path. The customer experience work is not for the mild-mannered or for the quarterly inclined. People are going to need to understand that this is a multiyear endeavor. They can’t bail in the first year. That would be a huge waste of human and financial capital. It will be the executive sponsor’s job to get everyone to stay the course. Is your CEO committed to the timeline required and are they willing to suspend the usual short-term expectations of immediate results and have the patience for the customer work to take hold and yield results? Will they sustain the patience inside the corporation and with the board to stay the course so that results can be achieved? To create the shift for an organization to cohesively deliver customer experiences is a huge undertaking. Yet it’s quickly agreed to when that charge comes from the president: “We must improve customer relationships and profitability.” Who wouldn’t salute that flag? But what flag did the company salute? What did they agree to accomplish? Therein lies the problem: the CEO’s request for customer commitment contains no direction. The organization doesn’t know what they’ve agreed to do or how they’ll get it done. The CCO can provide significant value to the CEO and company leadership by framing the scale of the undertaking and establishing a road map for getting the work accomplished over time. Are expectations and processes to drive the work identified realistically and planned so that people understand the road map, where it is leading and why it is set forth? Have the resources been applied so that the road map is grounded in the reality of what the company can achieve and fund? Jeanne Bliss pioneered the Customer Leadership Executive position, holding the role for over twenty years at Lands’ End, Allstate, Coldwell Banker, Mazda and Microsoft Corporations. 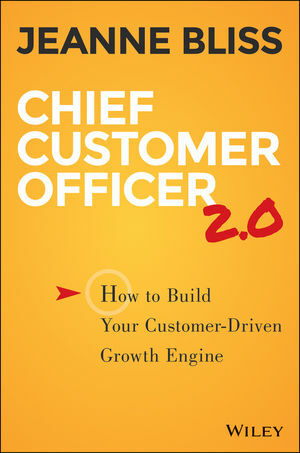 She is the best-selling author of the new Chief Customer Officer 2.0, Chief Customer Officer: Getting Past Lip Service to Passionate Action (2006), and I Love You More than My Dog: Five Decisions to Drive Extreme Customer Loyalty in Good Times and Bad (2011). You Onboard Your New Employees, So Why Aren’t You Onboarding New Managers? 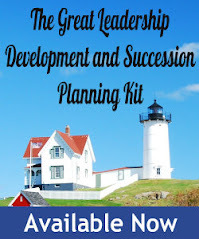 Read Beth Miller’s new post over at About.com Management and Leadership to find out how.